Back a few months ago after giving away a bunch of beer labels signed by Jermaine Rogers for Dogfish Head's 2014 seasonals, I started asking around who you guys thought was creating awesome beer label art. 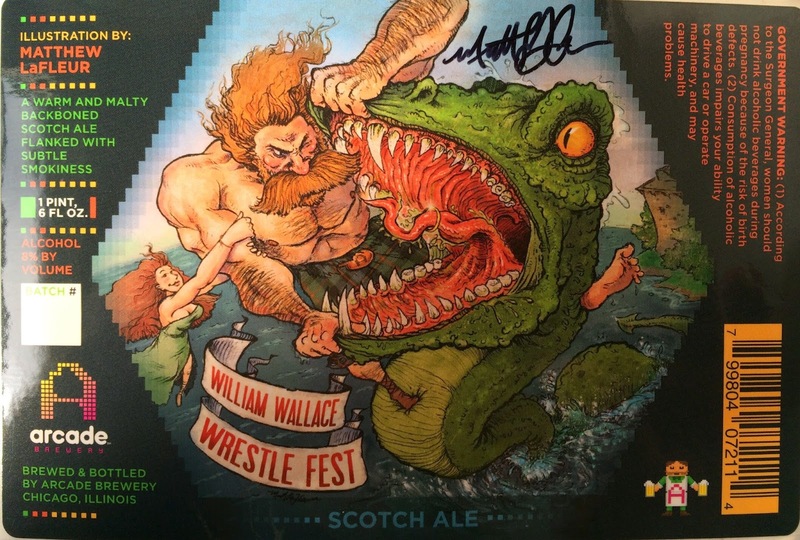 I heard more than one time the name Matthew LaFleur and in particular the label you see above for Arcade Brewery's William Wallace Wrestle Fest! Matthew is an illustrator and designer living in the Chicago suburbs. While doing some research before asking if Matthew would sign some labels for a contest, I stumbled on an interview he did with BeerLabelsArt.com, which gave me a ton of info and now happens to be one of my favorite sites! There I learned that after doing the label above, Matthew also created two others for two different breweries. Oh, and that he's a Syracuse University graduate and big Orangemen fan (I'm more of a Cornell Big Red guy myself, but you can find me on Twitter for that debate). The William Wallace Wrestle Fest label above was the winning entry in a contest Arcade Brewery had for that particular beer. After that, Matthew worked with Middle Brow Beer Co. and Transient Artisan Ales as well. I'm betting there will be more in the future too. In addition to creating the labels for those companies, Matthew is also a homebrewer and designs labels for his own beers too! Click that BeerLabels link above to see some of those awesome gems! You can also find some of his other work here or check out what he's up to on Facebook or Twitter. Very approachable guy, so ask whatever, wherever (and this is going to be part of the contest anyway, too). He's on every social media ever invented! OK. The Contest! This is going to be pretty simple as usual though you will need to give some effort. The winning prize is a set of all 3 signed labels above and I expect multiple winners! Complete 3 of the 5 questions/tasks below by next Saturday, March 21, 2015 by midnight (whatever time zone you're in is fine). I'll pick the winners within a few days and send the prizes shortly afterward. Enter by leaving your answers to the questions below as a reply, or if you must, email your replies to me (the email (minus your address) will be published as a comment in its entirety, so don't think that's a way to send a private entry). Don't plagiarize--that will be very obvious, especially with such easy open-ended questions. If there's a problem or disagreement, I'll solve it as judge and jury, even if I have to make or change rules. And seriously, don't make me track you down--I need an email or @ or some way to find you, or else your awesome entry is trash! The End. 1. 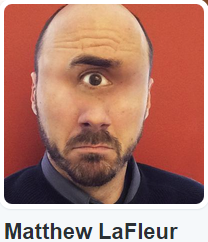 (required) You must follow Matthew on Twitter (easily recognizable avatar to the left) and/or "follow" (is that what you do there?) on Facebook. Then you must tweet or comment/question to him on one or the other--don't worry, only Nessy bites! Even if you aren't entering, definitely complete this part! 2. Name two other Arcade Brewery beers. Have you tried them? If so, give a one sentence review. If not, what do you think of those labels? 3. 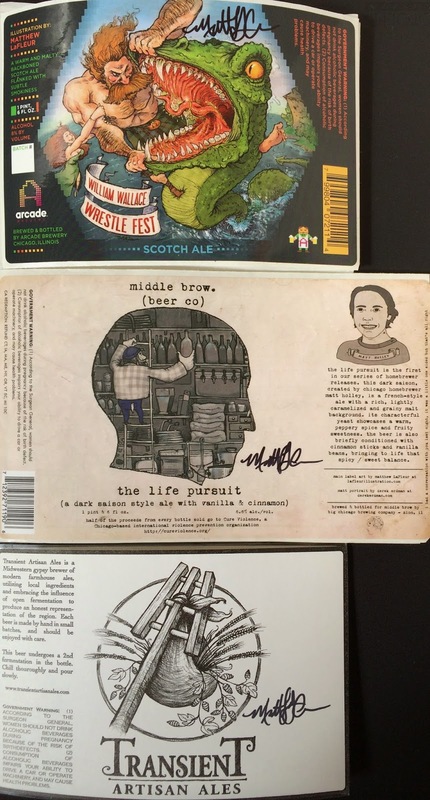 Which of Matthew's Homebrew labels caught your eye? Why? 4. Suggest a new beer name/label idea/beer style for one of Matthew's homebrews (hint: if you're shy, this could be an easy way to complete #1 too). 5. What are your favorite Chicagoland breweries that take the extra step to employ great illustrators and artists to give their beers an artistic advantage on the shelves? Explain. 2. Unfortunately, I haven’t been able to try them, but the Grapefruit IPA and Final Level caught my eye for the labels alone with the fun take on old school video gaming. And, after reading what kind of beer each were, I would love to try them both! 3. The Rusty Cage! I like fun monsters and this has one on the label, so I’m a fan. Three Floyds is another, but technically they are Indiana. However, their labels are always exciting art! 1. Done. We already follow each other. 2. Bronze Lion, APA. Final Level, ESB. There seems to be a theme with Arcade, haven't tried any, but would really be interested in the Winter Slayer. Plus #Slayer. 3. They are varied in style, which is very cool. Of the three, the label That caught my eye is the Transient. Great concept and an homage to Homebrew the way I see it. Like I told Matt on Twitter, it would make a great tattoo. 4. I'm partial to imperial stouts and recently brewed a separate batch from the second runnings off the mash. I added a ton of hops. OG was 1.056 and it turned out awesome. A similar beer would be great. A black IPA they would call it. You could name it "Game Over Man!" Like Hudson from Aliens. Blackness of space, no one can hear you scream, and all that sort of stuff. Two entries. Two winners! I have a few more sets so I'll actually leave this contest open and award them to the next TWO good entries. Richelle and Darren, I'll send your prizes this week. Thanks for playing.